I get asked this a lot over email. Yes, I can letterpress your design. You can design your own invitation and send it to me to letterpress. There are a bunch of caveats, but basically yes. These wedding letterpress invitations were my very last project before giving birth, and they were not designed by me. Aesthetic preferences aside, left on my own, I would not have designed an invitation like this because it was actually quite challenging for me to get the final result like this, and most of Joie Studio's creations are designed with my printing quirks and preferences in mind. But my clients are my dear friends, and their dear friend and designer Mr. Tan Ly designed these. They liked this design and wanted to have it letterpress printed, and I like trying to figure out ways to make designs like this happen. To achieve the gorgeous black ink coverage, I used the Vandercook for the black ink and then for speed I used the Pearl for the blind deboss, the burgundy, and the envelopes (not shown). If you've designed something that you would like letterpress printed, and this is targeted to all you DIY brides and grooms out there with your DIY invitation designs, or if you are a designer with a design you would like to see letterpress printed for your client, please feel free to contact Joie Studio at yourletterpress@joiestudio.com. For years, Crane's Lettra has been the house paper here at Joie Studio. Other paper selections have been special orders or have been provided by my clients. 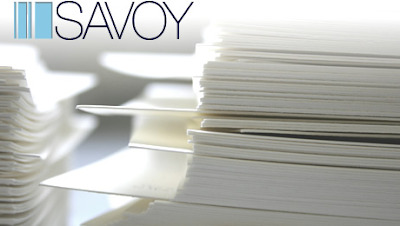 I have been recently giving my clients a choice between Lettra and the new Reich Savoy, and the response has been so good that I am going to start keeping Savoy as a house paper for invitations and custom orders here at Joie Studio. I'm still working on getting a local supplier for the envelopes, but the paper is definitely here and in the house. Contact me with any questions about our new paper! Once upon a time I made websites for colleges and universities. Then I made websites for small businesses. Then I made websites for events. Then I made invitations for events, which led me to this whole fascinating world of letterpress. and the rest is history! Now I'm wholly intrigued by this whole cloth diapering world, which I had the chance to learn about while making this website. Check out the website. I think it looks awesome. And if you want to try out the Glamour Wash, use TRYLU at checkout for 25% off (for a limited time only). My husband noted to me the other day that I should get back into the practice of taking photos of custom letterpress projects as they finish. I think I should get back to blogging and sharing, too! I'm so sorry I haven't been sharing the letterpress and design goodness going on here. I blame the little boy in the picture above. Where does all the time go?